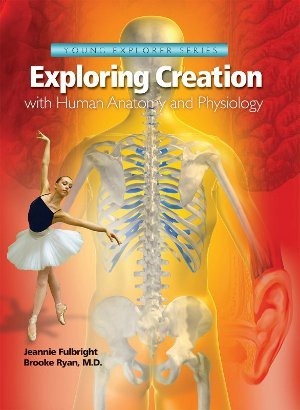 As part of the Old Schoolhouse Review Crew, Liberty and I have been using Apologia Educational Ministries’ Exploring Creation with Anatomy and Human Physiology for many weeks now. 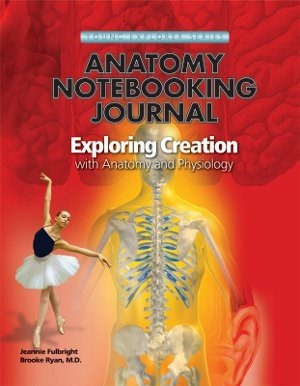 Liberty has been journaling in the Notebooking Journal and we’re been using the Anatomy and Human Physiology MP3 Audio CD as well. I was thrilled to be chosen for this review. I’d long heard good things about Apologia and wondered if it was true. Could kids really be so excited to do school that they are asking for more? Umm, yes. I’ve been asked every day since we started if we can do science. We’ve done an experiment “mummifying” an apple and saw the differences between the one submerged in salt and baking soda and the one left open to the elements. We’ve studied bones and discussed them at length. 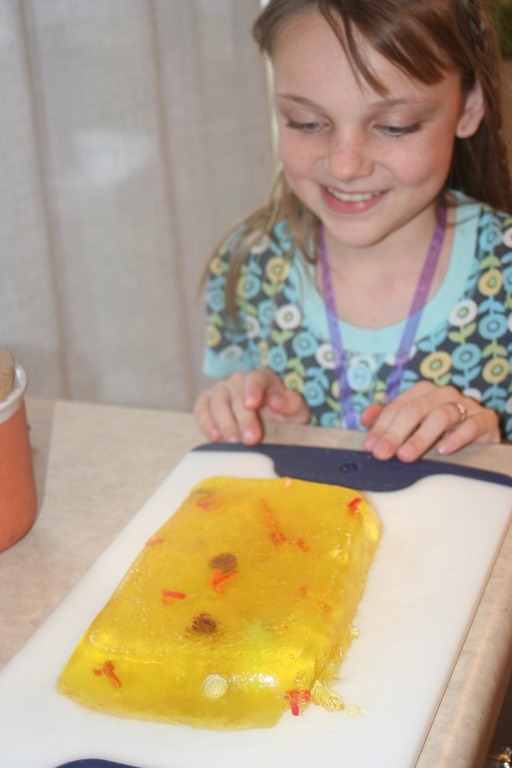 We’ve made a Jell-O “cell” with candy components. You know what the coolest thing was? We went on our own little field trip to the Discovery Center and the kids got to do a science experiment. They got to scrape their own mouths to look at their own cells! After studying this the week prior, there was Liberty, naming all the parts of her own cells, remembering what she’d learned and being able to apply it. That was pretty awesome! I tend to be pretty bare bones in the classroom. I’m so busy with all of them, if they can work alone, all the better. If I have to get too involved, I’m pretty unlikely to choose that curriculum again. This one, I wouldn’t have had to be involved too much. She could listen to the CD, read the book on her own, and I could provide the materials to experiment with and she would have needed little instruction. But this has never happened before: I wanted to be there. I wanted to learn this stuff too! It was really easy to use, and before shopping, I just flipped ahead to see what we might need. Most of it was pretty basic and we had it on hand, but the Jell-O cell required a few extra things. I’d do it again in a heartbeat though. 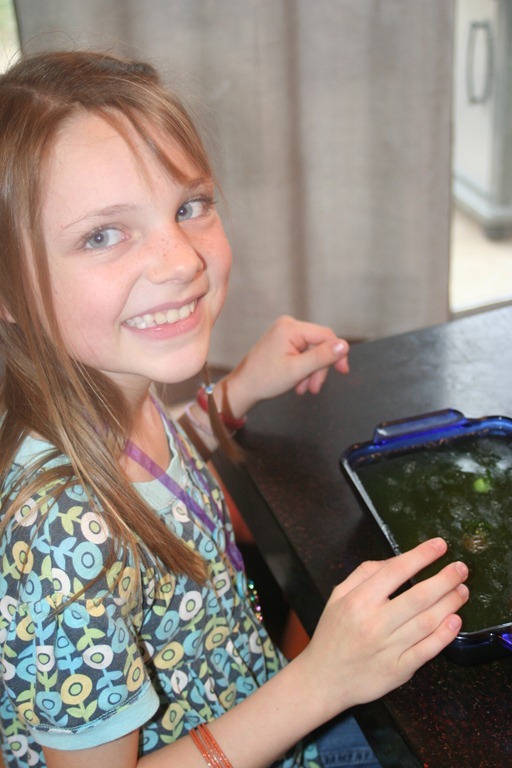 Liberty had so much fun and learned enough to be able to name cell components again the following week! I plan to use these materials for science for all four of my older kids, who will be 5, 6, 8, and 10 in the fall. I’m sure the older students will get more out of it, but judging from the little chins I had to tell to back up for those Jell-O photos, they will still be interested and learn a great deal. Even I’ve learned a bunch! I have to admit, I love this stuff. That CD got less use than it would have in any other subject – I wanted to read it! On the busy days, it’s a great idea, but I really enjoyed reading this aloud on the days when I could make time. The Anatomy and Human Physiology textbook is hardcover and is $39.00 on Apologia’s website. It is recommended for elementary ages and beyond, depending on each student. I think it could easily be done for all elementary ages – but the little ones won’t get as much out of it. The notebooking journal is spiral bound softcover and lists for $24.00. It is for students with upper elementary writing skills, and they offer a Junior Notebooking Journal for those with limited writing skills. The MP3 CD is $29. If your budget is tight, I’d suggest getting just the text and you could use your own notebook and, with a bit more work, make a pretty good notebooking journal of your own. If you have the extra funds to be able to swing the notebooking journal, I’d highly recommend it. It makes remembering the information studied that much easier. The MP3 CD is a great add-on, especially if you have a student who struggles with reading and learns verbally better. I love this curriculum. I’ll definitely continue this one and pursue their other sciences in the future. Any textbook that has them begging for more is worth a second look! Disclaimer: I received a free copy of these materials through the Schoolhouse Review Crew in exchange for my honest review. I was not required to write a positive review nor was I compensated in any other way. All opinions expressed in this review are mine and my family’s. I am disclosing this in accordance with FTC regulations. ← It’s going to be a doozy of a week. Apologia is used in the upper grades for Sonlight. I love what we use now for the same reason that you loved this week…the girls remember what they learn and apply it when they see it other places!Enjoy! This one looks SO cool! I’m going to remember it for when my kids are a little older! Great review! We love Apologia science too!